The original RV curtains and valance. Much nicer and easier to use than the blind was. 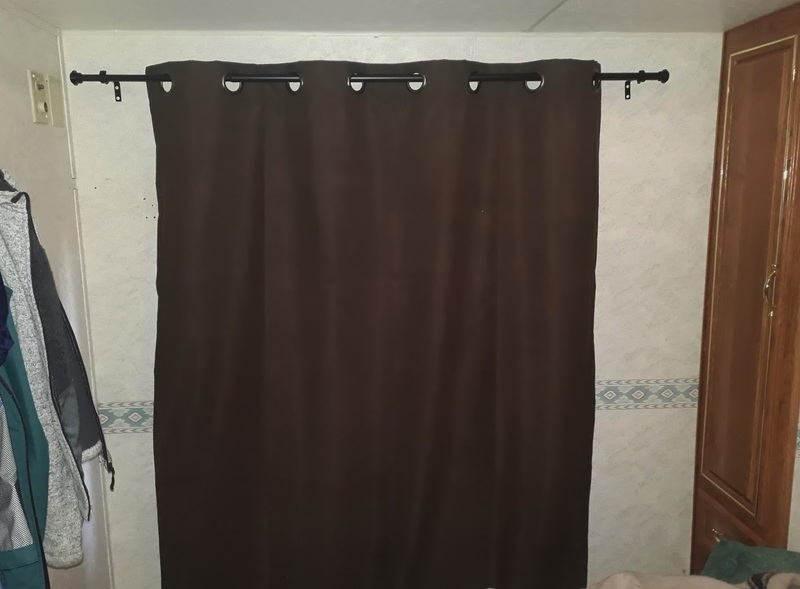 But the single panel is almost not wide enough, so we're going to put a couple of pieces of velcro on to hold the curtains tight to the wall in a couple of places. Anyway, we're happy with it, for a total cost of about $50 for both sides! The dinette table will be a little more costly. The original table is actually terrible. I don't think they could have made a table less attractive. And the metal hardware makes it look even worse! We've always hated this table! We've often thought of having one made while in Mexico. But for whatever reason we've just never got it done. Well, our son in law Justin is a professional cabinet maker and wood furniture craftsman. It's not what you know, it's who you know! He's currently working in the concrete construction business, so he doesn't get to use his woodworking skills and tools as often as he would like. So we asked if he would make us a table and have it ready for when we leave for Mexico next month. So he suggested some types of wood that we may want to look for. A nice hardwood. Ruth and I drove to a local specialty wood shop called the Wood Source. Sure enough, they had lots to choose from! 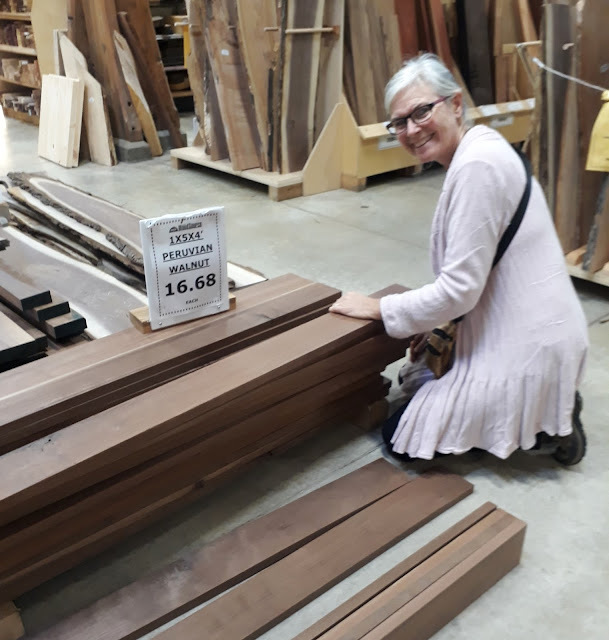 Ruth, with our "Peruvian Walnut" table material. We picked out the six best pieces, and went to the cash to pay the $113 CAD ($92 USD) bill. For six pieces of wood! Oh well... we did want something nice, and it will last forever! Can't wait to see the finished product when we return from Barbados! Halloween candy is on Deal of the Day today! I did the same with my curtains, and noticed that the windows are wider and used velcro, that made me laugh that we did the same thing! I had the same crappy table on my boat, many years ago. Your new table will look great, the money you saved on the curtains can niw be applied to the table, and Justin will give you a deal on the labour cost, no doubt. Looking forward to seeing the finished table the curtains look good. Enjoy! So are we! Actually I have finished the curtains already but we can't show a picture yet as I am up at my Dad's this weekend. We have thought we should do something with the table for many years so we are very curious to see what he does with it. We made plywood table - sanded/stained/etc came out really nice; not as heavy as previous table (toyota motorhome). Table slides,allows placement of tv & other items in side table storage. Made table little smaller - original was too large. 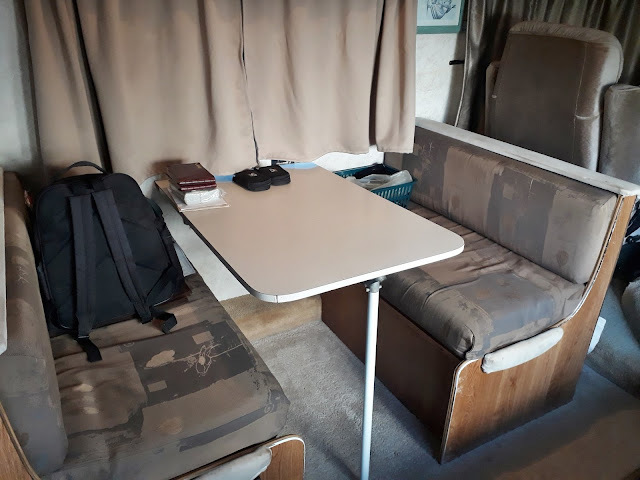 We like table in our class A motorhome. Can't wait to see what Justin makes for you - know it will be beautiful - that's some gorgeous wood you choose! Have fun in Barbados, best weather this time of year! Getting to end of hurricane season; ends Nov 30th - so GLAD! Our table is definitely going to be a little heavier than the original but not too much heavier. The wood looks beautiful so it should turn our really nice. Also Kevin wants the table to be a little longer than the original rather than smaller. Funny how people look at things differently. I am sure your new table will be great, love the wood you picked out. 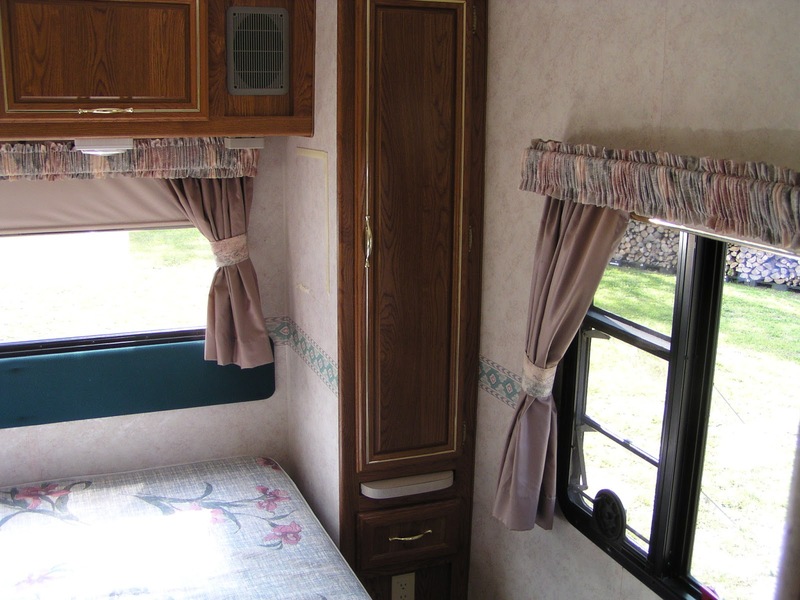 So many things are made poorly in RVs and vehicles, sometimes replacement is necessary. Yes, it should look great, especially with our choice of wood. This table wasn't great to start with and this is from back in the 90's when things were a bit more sturdy, I would hate to think what they are like now because as you said, things just aren't as well made these days. I am sure Sherman is feeling younger every day you make an improvement. Can I come with you, oh nuts, I just remembered I had a heart attack 5 weeks ago, so go on without me. Keep reading our blog and hopefully we can make it feel like you are traveling along with us. Hope you have a speedy recovery. We have already recovered the dinette seats a few years back, the seats used to be a funny rainbow of colours between blue to mauve. Having said that, the material that I used wasn't upholstery material and it is starting to wear through, so we are already thinking about new material for them as well, maybe this will be something we will get done in Mexico.